1W. Poehlmann (e-mail: Wolfgang.Poehlmann@alcatel-lucent.com) and T. Pfeiffer are with the Optical Access Research Department at Bell Labs in Stuttgart, Germany. 2D. T. van Veen and R. L. Farah are with the Optical Access Research Department at Bell Labs in Murray Hill, New Jersey 07974, USA. 3P. Vetter is with the Fixed Networks Research Program at Bell Labs in Murray Hill, New Jersey 07974, USA. 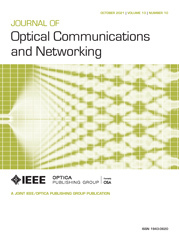 Thermally tunable burst-mode directly modulated lasers (DMLs) are the lowest-cost choices for the optical network units in time and wavelength division multiplexed passive optical network (TWDM-PON) systems. However, a fast wavelength drift caused by the burst-mode operation of this directly modulated distributed feedback laser needs to be considered. The drift can result in power penalties by effectively reducing the received optical power and also in crosstalk penalties when the signal drifts into neighboring channels after passing through the wavelength division multiplexed filter. In this paper, we report measurements and mitigation methods for this unwanted wavelength drift.